Motorcycle protective apparel dealer introduces brand new Roland Sands motorcycle jackets. Roland Sands makes an incredible product that exceeds our standards in quality and design. Roland Sands Design is a Motorcycle apparel and parts company based out of California. They are best known for their contemporary yet nostalgic take on motorcycle leather Jackets and gloves. Roland Sands has won over fans from all riding styles throughout the world. They are unique within the motorcycle culture for their passion for style and building custom motorcycles, notably their cafe racers. Rolands Sands has built custom motorcycles for companies like Ducati, Dunlop, Harley-Davidson, Piaggio, and Triumph. This is a company built by a true motorcycle enthusiast. New for 2013 are five men’s motorcycle jackets, the Barfly, Enzo, Fubar, Hesher 2, Vandal, and two new ladies motorcycle jackets, the Maven and Vada. These new motorcycle jackets continue the Roland Sands American design, and American inspired tradition. "Roland Sands makes an incredible product that exceeds our standards in quality and design." 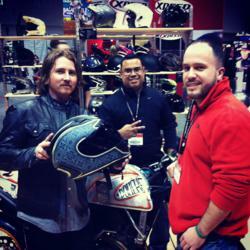 Motochanic is the premier motorcycle dealer in the New York, New Jersey and Connecticut Tri-State area. Motochanic specializes in motorcycle helmets and protective gear, from premium brands like Alpinestars, Arai, Bell, Dainese, AGV, Fox Racing, Gerbings heated gear, Revit, Shoei, Schuberth and Klim.